Today we launched an update to our Slack integration to take advantage of Slack's latest feature: actions. 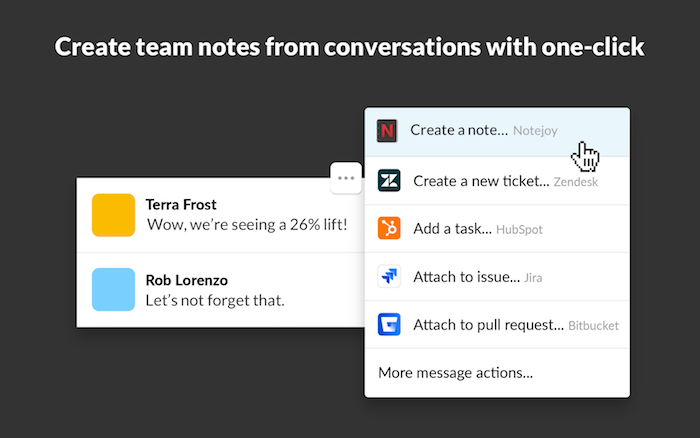 You can now create a note from any Slack conversation in just one click! While we've always enabled you to use our /notejoy grab command to create notes, you can now do so without having to remember the command at all. Just click on the More Actions menu (the triple dots in the top-right corner of a message) and select "Create a note...". You'll then see a dialog to allow you to customize the note's title, notebook, and body, all without leaving Slack. If you haven't yet installed Notejoy's Slack app, get started here.